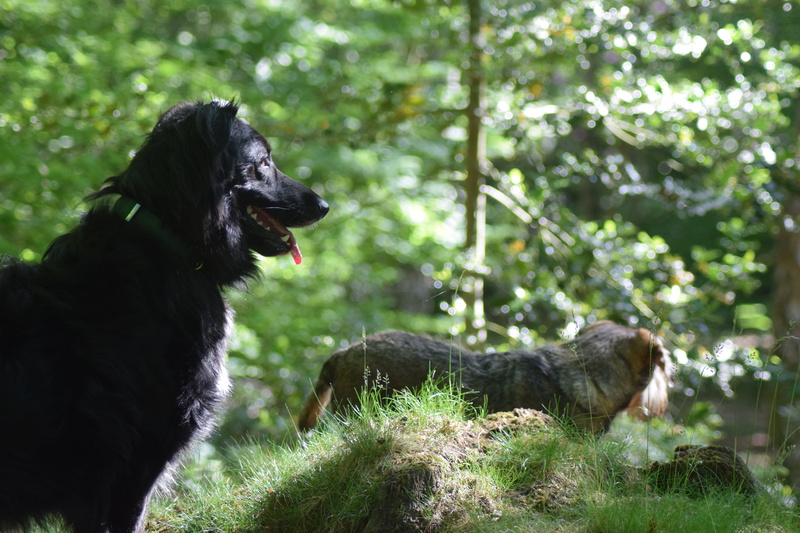 So there we were, myself and a great black hellhound and a compact black-and-tan opinionated terrier-type, minding our own business in the middle of the forest. The rain had rained, and puddles were abundant, mirroring the sky and affording paddling opportunities beyond any dog’s wildest dreams. While I will confess to cold feet and a fervent wish I had put on my wellies, I will own there was an atmosphere of industrious content amongst the canine troops. And then, we heard the bells. It was for all the world as if Christmas had barged in three months early, and one of Santa’s more disordered and erratic elves was charging in random directions through the undergrowth. Something was in there, and it had bells on. Fred, who is the sort of dog one wouldn’t mess with on a dark night, reported directly to me for clarification. An anxious ex-rescue dog, he likes to be clear on exactly what is happening all the time, and bells did not fit the morning walk profile one iota. I was not able to reassure him: the bells were getting nearer. And, if such a thing were possible, crazier. They were those Indian sleigh bells which get wheeled out at Christmas plays so that four-year olds, usually the ones who are not to be trusted up on stage, can wave them ecstatically and with very little sense of rhythm. But all those four-year olds were still tucked up at 6.30 on a damp and inhospitable Autumn morning in a soggy forest somewhere just outside London. Macaulay the dog simply did not register the sound. His smellscape had him in its thrall and the world had gone away, and now everything was him and the soft decay of English woodland. He redoubled his efforts to track the source of something compelling and possibly, to a human nose, horrifying. For a moment, there was only stasis: me and Fred, searching the undergrowth for the unhinged elf running amok. And then it appeared: a windy-bendy dog, a peaky blinder, a lary longshanks of a creature. It was tan, and its physique was all over the place: long bushy tail, impossibly thin pin-legs, greyhound nose. It shot wildly out of the ferns to the right and cannoned across our vision, and we saw the bells: they were on its neck, a sonic collar, a festive furore completely out of keeping with its mien. I am not sure it liked the bells, but it was clear why they were there. Complete strangers, we could track him as he ran off down a parallel path in joyful delirium in search of squirrels or deer or maybe just adventure. I imagine the intention of the owner who had fastened such a contraption to this wildly joyful creature was to keep track of him. Alas: there is a fatal flaw in the owner’s reasoning. For Longshanks ran like the wind, and I would hazard a guess that his owner was three miles away, close to the kebab van which parks at the edge of the forest. Any attempt to coral or get the dog’s number was foiled because, simply, you couldn’t catch Longshanks unless you had a Ferrari, and that was not going to happen at 6.30am in the middle of the forest. The sound of the bells dwindled gradually to nothing, and Freddie reverted to being At Ease. And I found myself wondering if Longshanks’ owner ever, ever caught up with him, or is still running through the forest, calling his name and listening for the sound of Indian bells. Posted in Macaulay The Dog stories, UncategorizedTagged bells, dogs, pets, story, walksBookmark the permalink. Brilliant! Of course the owner, despite being occupied by the kebab kiosk, may well have been a roly-poly fellow dressed in red out on a pre-Chrimbo recci! You are such a master at vivid storytelling, Kate, that when I just tripped over the printer on the floor by my desk, I thought that it might have been Longshanks racing through the borough of Queens here in New York City. I almost thought I heard bells, but that was actually the ice cream truck outside my window. Ha! I have a feeling Longshanks might like Queens, but the dogs in Queens might have a few things to say about his collar, Virginia. Have an ice cream for me…. Strange that Fred didn’t seem to want to chase after them, Helen. maybe he just knew he would never, ever keep up. The story has a lot of ap-peal, with a ring of truth in it! I was amused at the Macauley indifference to the dashing clanger. On that hound, a satnav tracker would be more practical. Col, you are right. And when Longshanks’ owner finally catches up with him, if they have any sense, the first thing they will do is get a satnav for the dog. It’s an alpine viewpoint, that, Gabrielle 😀 Hope all is well with your gorgeous mutts. I love being able to imagine the forest. I can certainly hear those bells. Well, you are one of the few who has actually seen this little swathe of forest, Andra….following your adventures day by day with something like awe. Hope promotion is going well. Your determination and raw talent are incredible, and your Cheese-Its are only half gone. What can I say….. In that situation, Reggie would be more like Macaulay — oblivious to everything around him except the “delightful” smells he was unearthing. Nothing can distract him when he’s on the scent. Hi Jackie! Lovely to know there are other dogs out there for whom the world goes away when they find a great smell. Reggie sounds great. I am fairly sure his owner did catch up with him because there were no bells in the forest this morning! Hello Meredith, thank you for commenting! It was indeed eventful and I can’t understand why, unlike Nick, no-one gave chase. Perhaps he was just too fast….